It can be confusing to compare org chart software. There are tools to draw org charts by hand. There are tools to build org charts automatically from data. There are even tools that should never be used to make an org chart, but are still popular (watch out for Visio). Here at OrgWeaver, we make modern online org chart software. We spend a lot of time figuring out what works and what doesn’t for org chart users. Instead of keeping that analysis to ourselves, we thought it’d be helpful to share. Here’s our main points for how to compare org chart software alternatives. 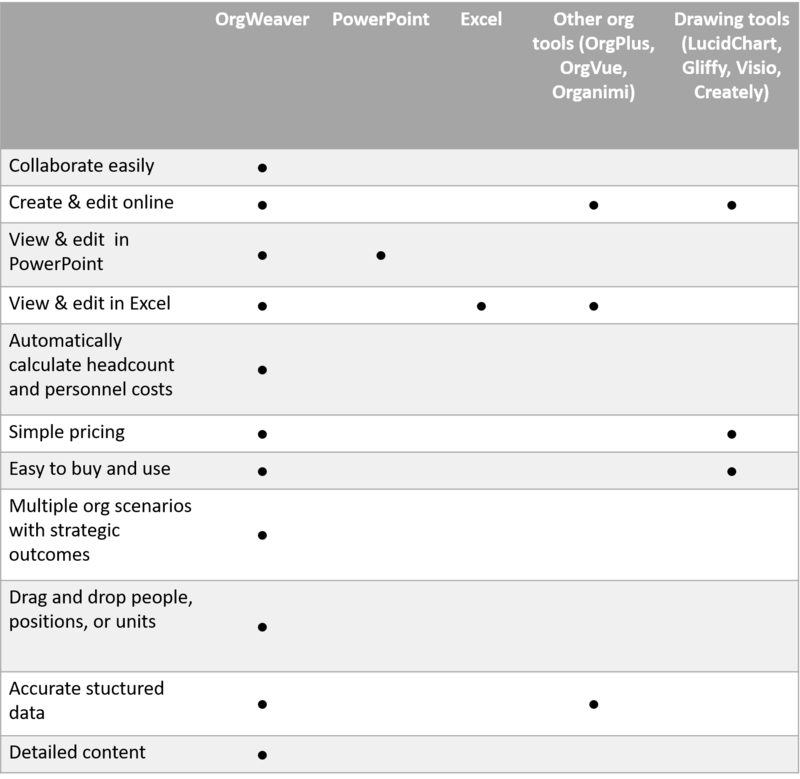 An org chart software should have simple affordable pricing (like LucidChart or Gliffy), automatically create org charts from data (like OrgPlus or Organimi), and still integrate fully with PowerPoint and Excel. We built OrgWeaver to fit into that sweet spot, but the proof can be seen first hand in our free org chart subscription plan. What’s the point of having an org chart if you can’t collaborate in real-time around it? This is often a frustrating part of finding an org chart software. In fact, many people give up and just get 10 people in a room drawing on a whiteboard. Desktop software is very limiting. That’s why the whole world seems to be moving to online tools that work in any web browser on any device. There is no “Facebook for your Desktop” for a reason. And org chart software should be no different. PowerPoint is a fact of life. If you’re going to present your org chart, you’re going to want to do with the most ubiquitous presentation software. Even though you want to keep your org chart online, it’s nice to export and make small tweaks in PowerPoint so that you’re presentation is designed perfectly. An org chart is so much more than boxes. It can show how your organization truly works today. It can be a strategic necessity when designing an organization for the future. Everyone wants to know how many people work in which departments, so it’s important that your org chart software automatically calculates that out of the box. If an org chart vendor doesn’t publish their prices, beware of their business model. It’s possible they are trying to sell “nice-to-have” features for astronomical prices that you never actually use. If you can understand a vendor’s pricing without talking to a sales person, that’s typically a good sign that they are focused on adding value at a competitive price. If you need an org chart today, you don’t have time to go through a purchasing process. If you can get started for free, upgrade in the org chart software with a credit card, and train yourself with in-app tutorials, you can save a huge amount of time and costs in the purchasing process. An organization isn’t just one org structure. It’s last years’ org structure and next years’ org structure. There are different scenarios to consider, and stages to an implementation of a new org structure. Great org chart software solutions allow you to visualize all the scenarios and their strategic impact. Org charts are easily understood when one box represents one person’s role. So that’s how they usually get created. But behind that simplicity there are more complex decisions. What if you want to move an org unit of 30 people to another org unit? Wouldn’t it be great to just drag and drop them all at once? Or what if you want to just move a person, but leave their current position empty? It’s important to find a software that allows you to just drag and drop exactly what you want. When making a comparison of org chart alternatives, it can be easy to focus only on looks. But behind every org chart box is data that needs to be structured. For instance, if you draw an org chart, none of the data is structured. It can’t be analyzed or updated automatically. The bigger the org chart, the less information it shows. That’s why it’s important to find an org chart software that has smart ways to show detailed content even on big org charts. For instance, if you want to show a photo, name, position, headcount, location, email address, phone number, personal bio, and position description on one org chart box, you better be able to design the box well.